Like implied in the quote above many of Friedrich’s works have a very melancholic, if not sinister atmosphere. No wonder that a lot of his paintings have been used by bands from all over the place as cover artwork. Especially Black Metal bands regularly make use of Friedrich’s output, which often shows ruinous churches and monasteries as well as megalithic tombs, often at night or in the snow. 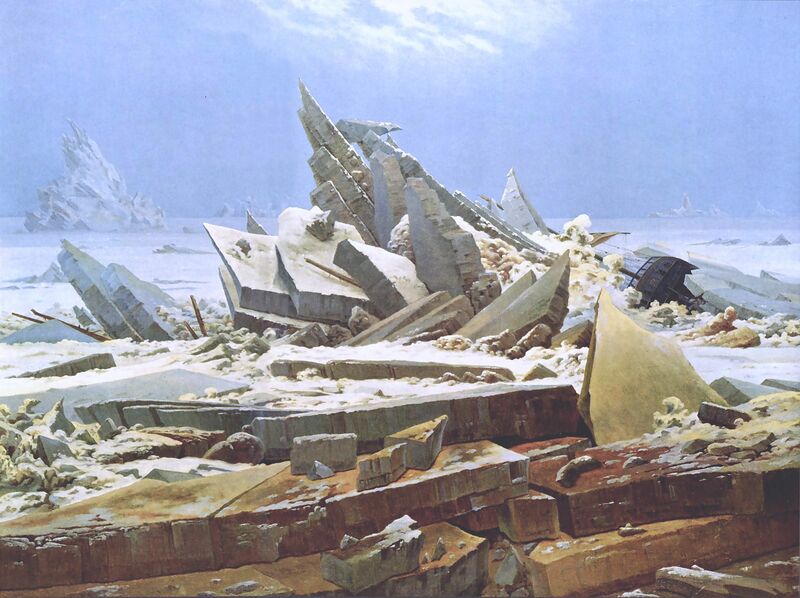 But one shouldn’t forget about Friedrich’s religious superelevation of nature and the fact that he also painted intact churches and crucifixes. After all, Friedrich was a genuine Christian. Friedrich’s work is replete with self-doubt, failure, melancholy, depression and hopelessness and is characterized by a yearning for the afterlife – features strongly antithetic to those of the “Übermensch” of the Nazi propaganda. It really needs an abyss of ignorance to blank this out. Besides that, Friedrich became a Freemason in 1807 – members of this secret society were persecuted during the Nazi regime. As it is, every era provides an own interpretation of Friedrich’s creative work, but its complexity isn’t easy to conceive. It’s probably this factor that opened the doors for misinterpretation and misuse in the past. 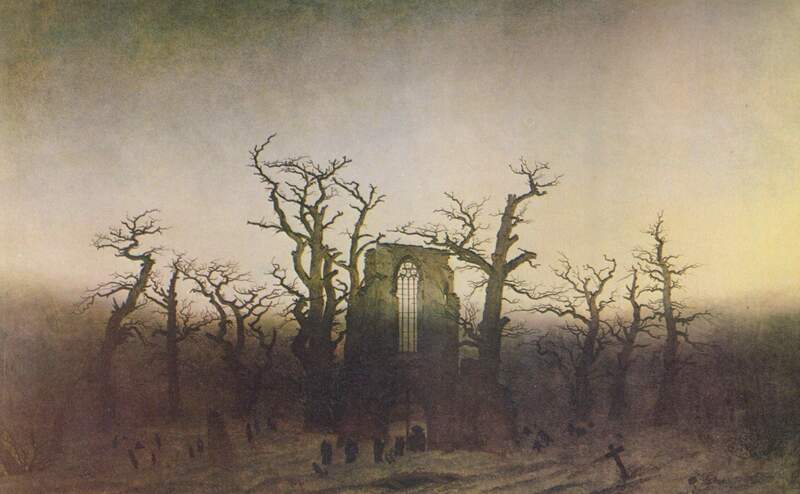 The Abbey in the Oakwood is one of Friedrich’s earlier and probably best known works. In the center you can see a group of monks walking towards the derelict church portal, some carrying a coffin. In the foreground there’s several crosses and an open grave to see. The faint winter sun is located on the right, the crescent moon above the scenery. The painting is based on the ruined monastery Eldena, which is located in Greifswald, the city where Friedrich was born. The ruin can still be visited. This painting was completed in 1807. Cairn in Snow shows an pagan burial site, which existed near the town Gützkow in Germany. The cairn is surrounded by three oaks, a subject often depicted by Friedrich. Just like The Abbey in the Oakwood, the scenery is pictured in winter. 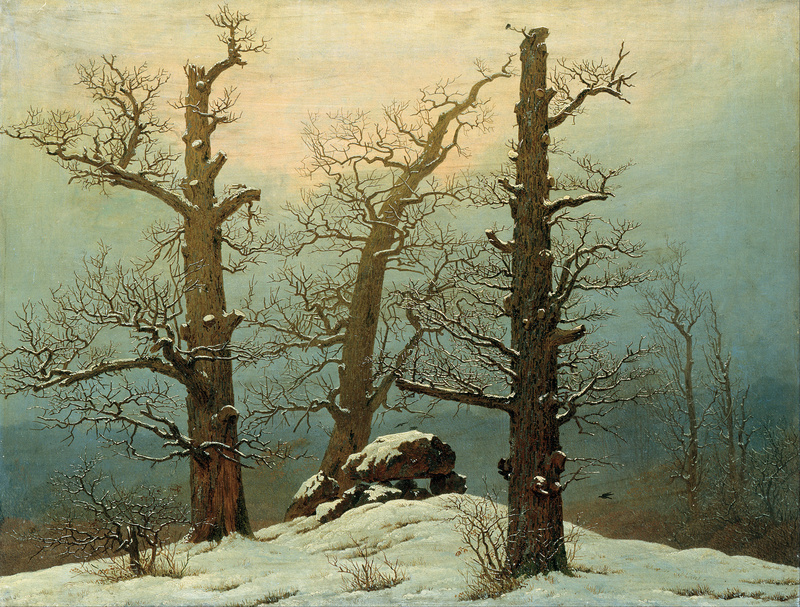 Friedrich used snow as an allegory for death. If snow is an allegory for death, this picture has written decease all over it. This work of Friedrich was named Die gescheiterte Hoffnung (“failed hope”) until 1965. Generally The Polar Sea is described as depiction of peremptory failure. While the background shows an expansive and calm nature, yet hostile to life, the foreground is dominated by the angular, harsh and threatening ice, which is just about to crush the ship to the right slowly and relentlessly. The Polar Sea might be one, if not the most influental piece of Friedrich. Of course these are just three examples of Friedrich’s immense output, and these humble words weren’t written down by an expert of neither art history nor Friedrich. 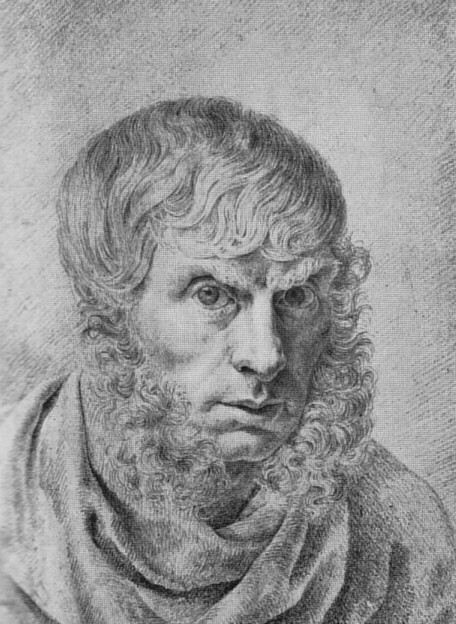 So if there’s any interest, there exist hundreds of websites and more importantly books that concentrate on Caspar David Friedrich’s life, work and perception, which are definetely worth to be checked out.